Constant-mesh four-speed gearbox The input shaft takes the drivefrom the engine (when theclutch is engaged) into thegearbox. 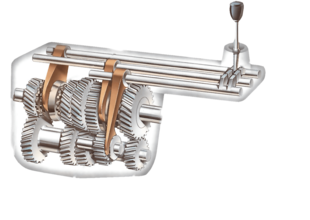 The selector rods and forks move thesynchromesh units back and forth,according to which gear is selected.Some gearboxes have only oneselector rod, others three; but theprinciple is the same. A spring-loaded ball at thebase of the gear lever alignswith a recess in the selectorrod holding the lever inposition until the driverchanges gears. When the reverse idler gear isselected, it is interposed inthe gear train, reversing thenormal direction of themainshaft. The layshaft transmits drivefrom the input shaft to themainshaft when a constantlymeshed gear is locked to themainshaft by means of asplined mesh. The mainshaft, or outputshaft, transmits drive fromthe layshaft to the propellorshaft, when a gear isselected. 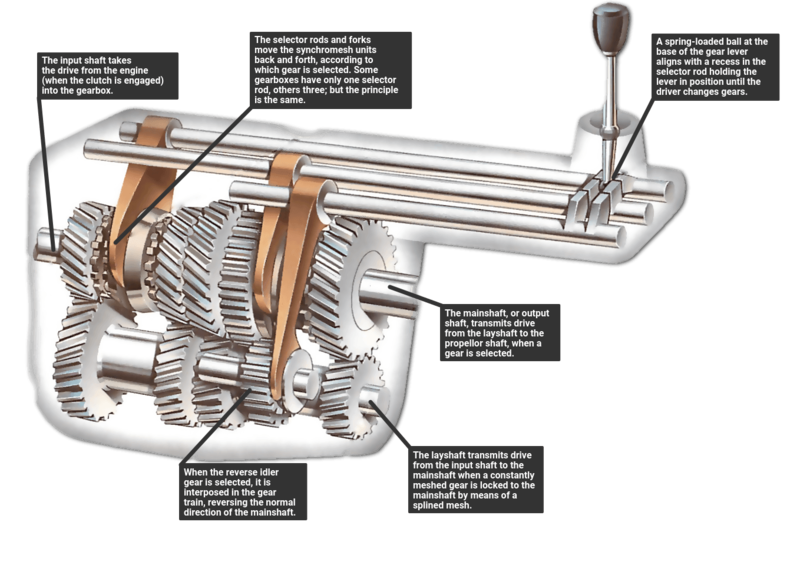 The gears are selected by a system of rods and levers operated by the gear lever. Drive is transmitted through the input shaft to the layshaft and then to the mainshaft, except in direct drive - top gear - when the input shaft and the mainshaft are locked together.